Unfortunately, this fan has been discontinued by the manufacturer as of 2/1/2019. 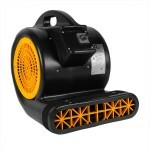 Check out all the air movers in our Air Moving Carpet Dryers for products we have available. This is a review for the X-Power 600 CFM Commercial Mini Air-Mover Fan.